Om Unit has built a deserved reputation as one of the strongest and most consistent artists in the electronic sphere. His 2010 reworking of Joker’s ‘DigiDesign’ was sanctioned by Kode9 for white label treatment & original material quickly followed on Fabric-curated ‘Elevator Music’ compilation, the ‘Lavender/Lightgrids 7’ for All City & ‘The Corridor’ EP for Plastician’s Terrorhythm imprint. Now across a series of 3 EPs for Civil Music Om Unit has defined himself as a uniquely talented & groundbreaking producer whose sound & style is distinctive yet diverse. He explored Real Electro on ‘The Timps’, experimented in Mechanical Soul around the 80/160bpm mark on ‘Transport’ & created the rousing cinematic journey of ‘Aeolian’. Om Unit was selected for the Red Bull Music Academy as part of the class of 2011 in Madrid & performs as part of London’s Tempo Clash residents with Kutmah, Kidkanevil, Blue Daisy & Offshore. He has launched his own label Cosmic Bridge & appeared on compilations for Project Mooncircle & Pinch’s Tectonic Label. Released across 3 volumes throughout 2011, Om Unit conducted the Philip D Kick experiment. (read more here) Conceived as an anonymous alias as PDK he pioneered the combination of Jungle & Footwork in a series of edits. Intrigue grew ever larger as the identity of the producer was sought. 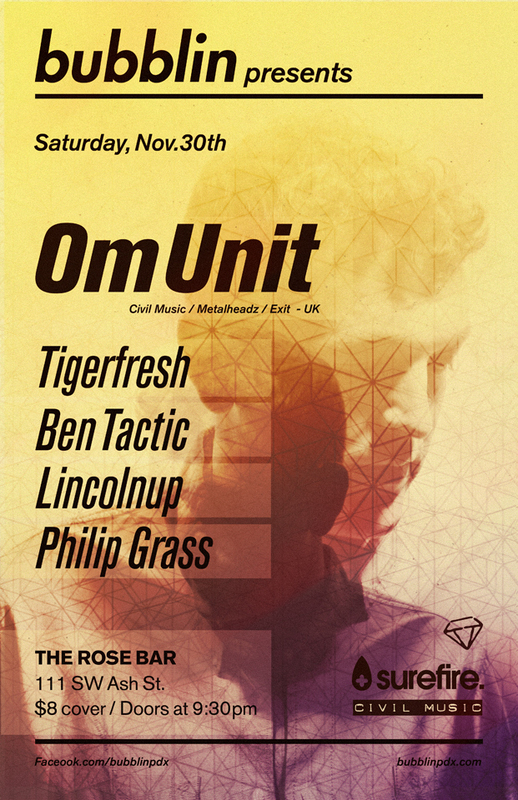 Om Unit simultaneously revealed himself as Philip D Kick & retired the alias at the peak of the hype but not before connecting with Machinedrum .The producers discovered they had independently conceived the jungle/footwork hybrid on either side of the Atlantic & went on to collaborate as Dream Continuum with the highly anticipated Reworkz EP on Planet Mu in early 2012. Om Unit has in a short time remixed an extensive list of peers, amongst others Daedelus, Om’Mas Keith, Fracture, Starkey, Ital Tek, Shigeto, Pixelord, Sweatson Klank, Illum Sphere, Adam Freeland & Foreign Beggars. He has collaborated with Mark Pritchard, ARP101, Lorn, Danny Breaks & Kromestar, made live appearances at Sonar, Glade across the UK, Europe, Russia, Australia, New Zealand & beyond and appeared twice on Boiler Room & provided mixes for XLR8R, Dummy, Lucky Me, Electronic Explorations, Clash Magazine & more. Based in London Om Unit is the alias of Jim Coles. Producing since his early teens starting with Jungle he graduated via the world of turntablism under the 2tall moniker to represent the UK in the DMC world DJ championships. As 2tall he appeared on the John Peel show, collaborated with Dabrye, Foreign Beggars, Kashmere, Jesht & produced 3 albums including ìBeautiful Mindzî a collaborative project with U.S duo Dudley Perkins & Georgia Anne Muldrow (Stones Throw), & ìThe Softer Diagramî on L.A-based Content Records. After performing Decks ëní FX in dubstep pioneers Various Productions & Jim retired 2tall in 2008 and reset. Now as Om Unit, with a career moving forward at rare pace, he has quickly become one of electronic musicís most pioneering & unique front-runners. One of the most exciting artists to emerge in recent times, his output, packed with unique combinations of style & diverse demonstrations of its makers adaptability, is consistently helping to shape musicís electronic landscape. After an already frantic year with releases on Planet Mu, All City, and continuing his work with his Cosmic Bridge imprint, ahead lies tracks for Metalheadz and Exit Records, more collaborations, an extensive worldwide tour schedule (including 2013’s Month-long US/Canada tour and Australia/New Zealand tour), and his debut album scheduled for 2013 with Civil Music. The future looks ever brighter. This entry was posted on October 31, 2013 at 3:20 pm and is filed under Bubblin. You can follow any responses to this entry through the RSS 2.0 feed. You can leave a response, or trackback from your own site.